Our guest's safety and enjoyment are always very important to us and a priority! All our properties are professionally maintained and managed, well maintained. Each property has full-time staff that is always happy to assist our clients. And did you know, that when you book directly with us you save $$$? We don't charge you any additional service fees (compared to the large online vacation brokerage sites), we guarantee that you will find the best price for our properties with us, and we also have fantastic specials that are generally not available anywhere else! In addition to that, we are real people, and we live right here in the Akumal area. We are passionate about our little corner of paradise, and we know that you will love it too! We are here to support you with your vacation planning and throughout your stay. Did we mention that we are local area experts? Please pick our brains for great things to see and do, tailored to your group. We have many exciting suggestions that you will not find in guidebooks! We'd love to see you again! If you have stayed with us before, we will give you a 5% discount when you book directly with us again. 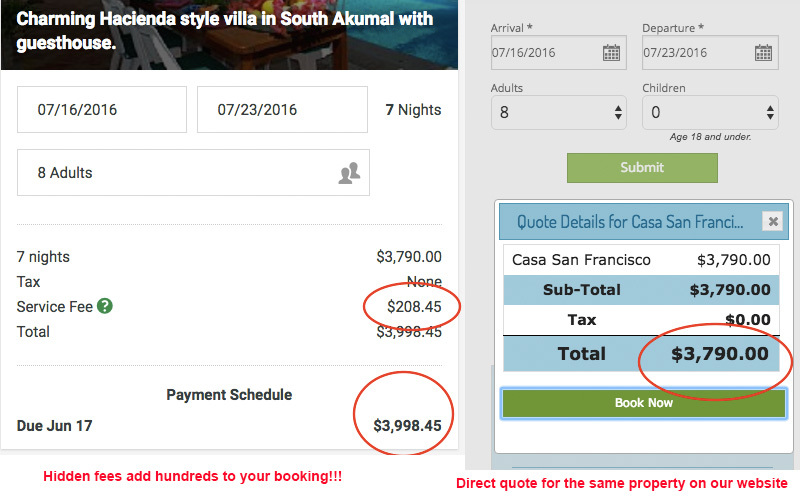 Akumal Direct is the easiest way to find your perfect place to stay. Always a great experience. What more can you ask for? By the time you're done you will have a new friend named Marcia and she's always looking out for you. It's a win-win situation! They always take great care of us, we have been using Akumal Direct Reservations for several years, no matter what size group 10 people or 2 they always help us find the perfect place to stay! Superior customer service!! Excellent, quick response to email! Great to work with! The most amazing reservation service in Mexico! They are friendly, accommodating, and helpful! Please see more reviews HERE.